On August 8th, 2015, The annual “Ride to Hell and back for our Gold and Blue Star Families” was a fun time and all the money raised went to Military Families United of Michigan! This is an opportunity for those around the state to come together in “Hell”, Michigan to a day of games, fun and prizes. The day ends with a balloon release with each fallen heroes names attached to one of the red, white, blue or Gold balloons. We have asked that if any of the balloons are found, to post them on the “Going to Hell and Back” Facebook page. 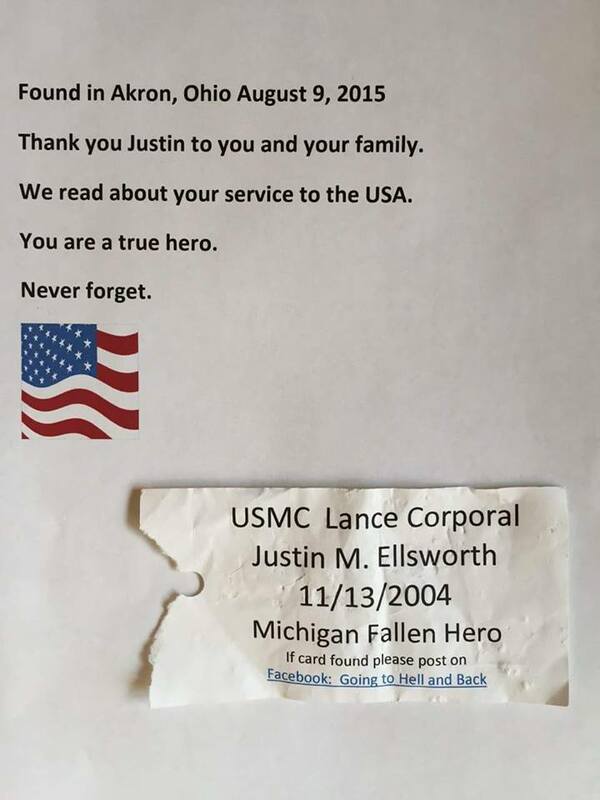 So far, only one has turned up and it happened to be LCPL Justin Ellsworth’s card that was found in Akron, Ohio! We will keep you up to date when others are found!